Hauskaa juhannusta, tervetuloa Allsorts haasteen pariin! Kesän kukkaloisto on parhaimmillaan, niin myöskin aiheenamme "kukat" seuraavan viikon. Tein varastoon muutaman Kiitos-kortin ihanalla pionileimasimella ja stanssilla. Alppiruusut ovat kukoistaneet useimmilla paikoilla, niin myös meillä, tässä kuvassa häälahjamme 23 v. takaa. Hi; Happy Mid Summer Fest, it's time for a new Allsorts Challenge! Our theme is "Flower Power"! Sponsor is Tattered Lace. I made Thank You- cards and I wanted them to be postal friendly! Your Rohdodendron is looking glorious Mervi, they do not like our soil here in the Fens so really difficult to grow. 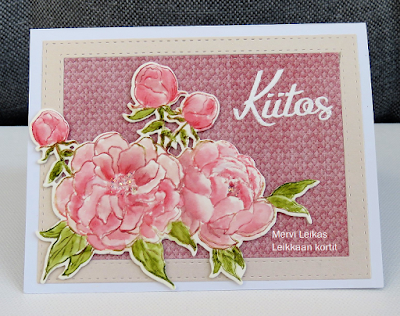 And your pretty card reflects the blooms beautifully. Upea leimasin ja upeat kortit! Gorgeous rhodi Mervi, unlike Brenda's soil our area is perfect for them and they flower all over here in Scotland. Really beautiful image Mervi and love the way you have fussy cut them. Some gorgeous background papers too but love the gingham one the most. 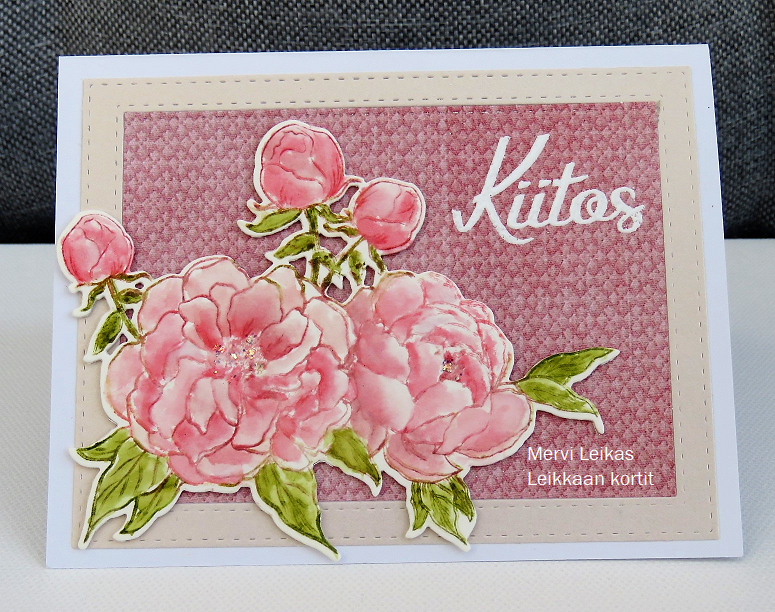 What a pretty set of cards, gorgeous flowers and love the stitched frame die cut you used! Sorry I haven't been around much lately, holiday and then other duties, but trying to get back into things again. What a beautiful flower image, it looks fabulous on your cards. 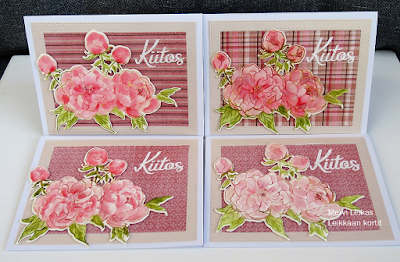 These are so beautiful--love the pink flowers! Yritin etsiä leimasinta mutten en vaan löytänyt.